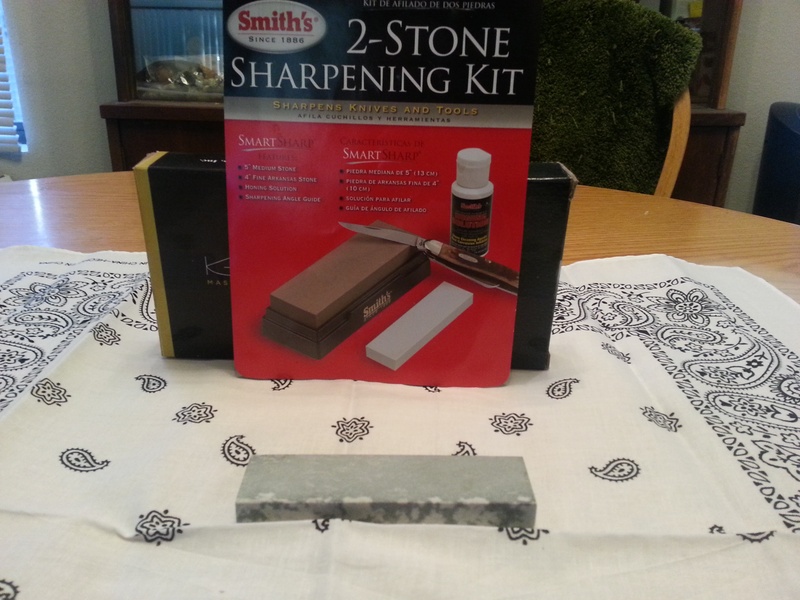 The Smith’s SK2 2-Stone Sharpening Kit is a great beginners sharpening kit. 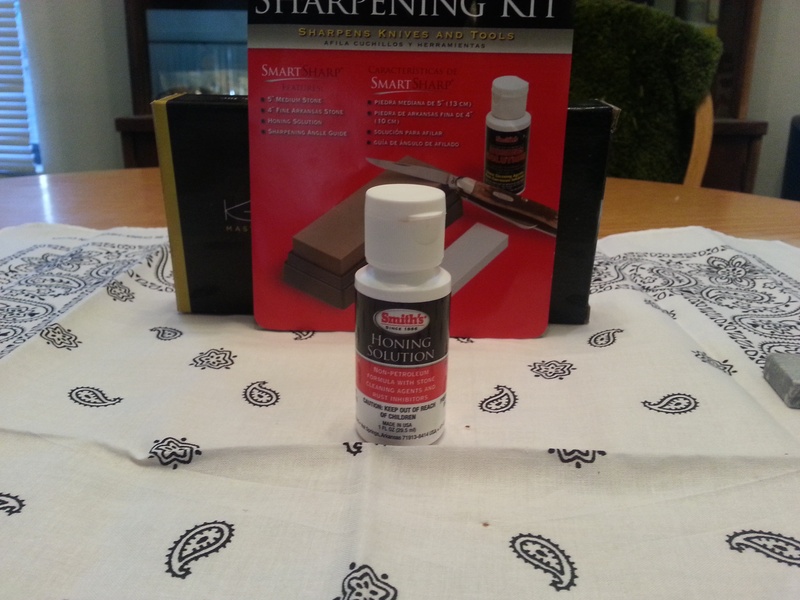 This kit would also work great for a season knife sharpener too. When I first ordered this kit I was terrified I was gonna ruin a couple blades before I figured it out but to my surprise the kit has all the tools and instruction for a beginner to make any blade you own razor sharp without grinding the blade flat. It is a four piece kit that comes with a 5″ Medium Stone, 4″ Fine Arkansas Wet Stone, Premium Honing Solution, Sharpening Angle Guide. All the piecing are made of high quality materials perfect to get any blade hair splitting sharp. Smith’s has been in the knife/tool sharpening game for over 100 years! They offer a full line of easy to use sharpeners, the different ones they offer are Diamonds, Ceramics, Bonded and Abrasives, and Carbides. Not only are there products top of the line but they also have the lowest prices. Now lets talk about the different pieces that come in the kit. First off it has a 5″ Medium Stone that comes on a plastic base that features a built-in stone storage for the Arkansas stone on the bottom. The Medium Stone quickly sets the edge on the knife or tool and starts the sharpening process. This stone will last a lifetime of sharpening if taken care of properly. One review I read on Amazon was by a guy who bought the Smith’s kit in the 80’s and is still using it today. Wow!!! Now that is how products are supposed to be made. This was the stone that I was worried about using the most cause I was afraid that I was gonna have a flat dull blade after a few strokes, but to my surprise that wasn’t the case. Next up we have the 4″ Fine Arkansas Stone. The marbling on the stone looks awesome. 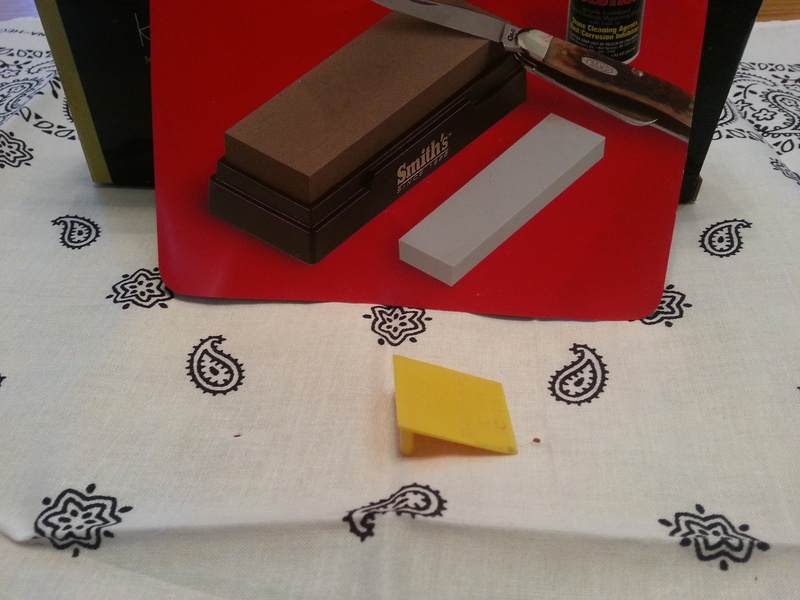 The Arkansas Wet Stone is a fine stone that you use after the Medium Stone that will polish your knife/tools as it brings your blade to a razor sharp edge. The Medium stone with the base has a great storage spot for the Fine stone on the bottom of the base. It has two rotating arms to lock the stone in place. What a great idea, makes storage easier and traveling easy too. The less pieces to pack the better in my opinion. 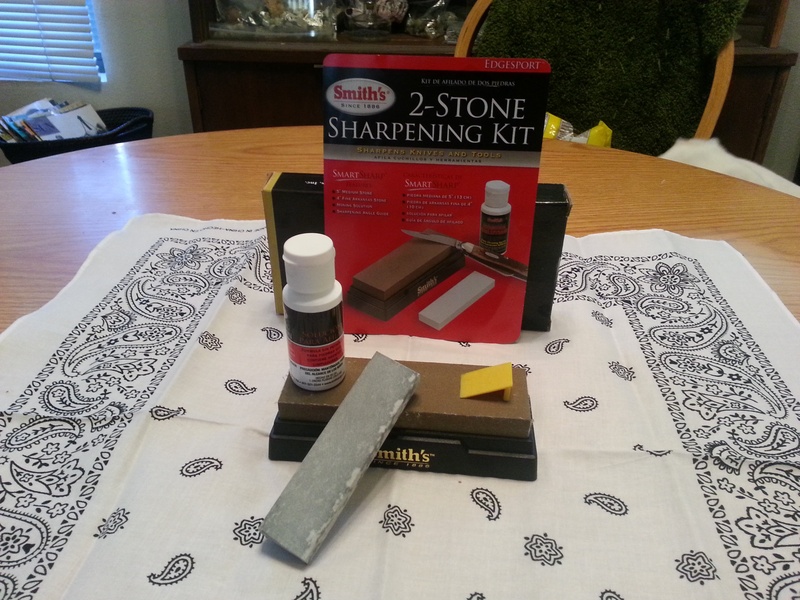 Next the kit comes with a Premium Honing Solution that Smith’s says to rub on the sharpening stones before each use, and once your finished just rinse it off. The Honing Solution is a pink liquid that is non-petroleum formula that assists in a smooth grind while cleansing the stone and also has a rust inhibitor in it to help keep your blade rust free, which is important if you use your knives in a wet/moist environment. The first time I used the kit I pulled out an old straight edge Gerber RipStop knife(I will be reviewing that here pretty soon) that if it got ruined it wouldn’t be the end of the world. I definitely wasn’t gonna start on my new Ka-Bar USMC Fighting Knife that came with a super sharp edge, I would probably just have made it duller. After opening the packaging and discovering the guide I wasn’t as nervous, now I was more anxious to bring my older knives back to life. Per the instructions first you must apply a layer of the Premium Honing Solution over both stones. Then place the guide at one end of the stone and gently slide the knife across the stone using the guide to get the perfect angle. After a couple of passes on each side I switched to the Fine Arkansas stone and gave a couple more strokes and boy did it make a huge difference. Before I sharpened the blade it wouldn’t even cut paper, after I was finished the knife made quick work of a sheet of paper and turned it into confetti. After that I was sharpening anything I could get my hands on. Once finished sharpening all my knives just run the stones under some water and presto the sharpener is clean and ready for the next time. Smith also recommends that after sharpening 3-4 knives to use some gentle soap and warm water and give it a little scrub to make sure all the pores are free of metal particles that could damage the stones and shorten their life span. In my honest opinion I think every knife owner should own one of these kits to keep their weapon/tool in optimum condition. You never know when you are gonna need your knife/tool and you don’t wanna get caught with a dull blade. 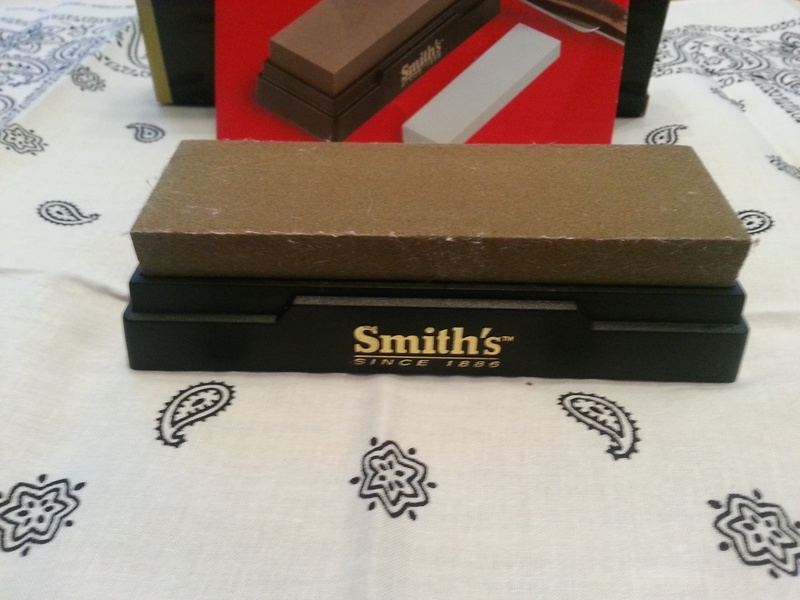 Please keep an eye out for the video that will follow giving a presentation of how to use the Smith’s SK2 2-Stone Sharpening kit. Once again thank you for visiting my blog and please leave any questions or reviews in the comments section. Also stay tuned for my next review. This entry was posted in Gear, Sharpener, Tactical and tagged Abrasive, Arkansas, Arkansas stone, Honing Solution, Ka-Bar, knife, NW, NWTactical, sharpener, sharpening kit, Smith's, Smith's SK2, Tactical. Bookmark the permalink. I mostly used the small stone on my slipjoints.